I bottled and processed over a dozen pint and quart jars last week and have another dozen to go. 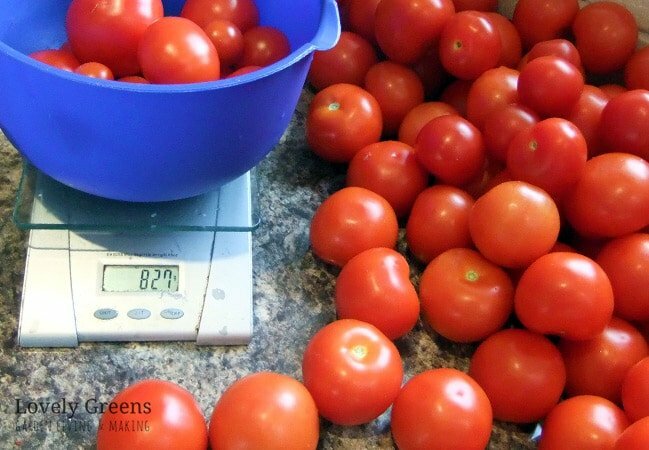 The process is simple and easy and a great way to preserve a glut of tomatoes or crates of them bought in bulk. 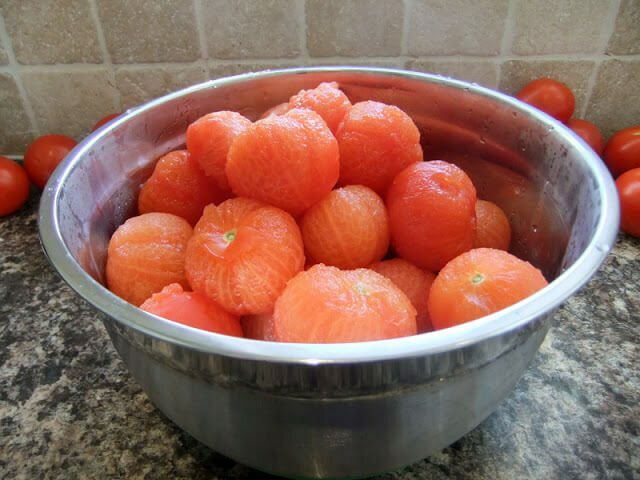 It involves a few steps including skinning the tomatoes, cutting them up, packing them in, and processing them. Although tinned tomatoes are inexpensive there’s something special about preserving your own harvest. Imagine your homegrown tomatoes lining the pantry shelves long after they were growing on the vine. Just taking one down to use for dinner can bring you back to summer. On a more practical note, you can also guarantee that your bottled tomatoes are organically grown if that’s important to you. 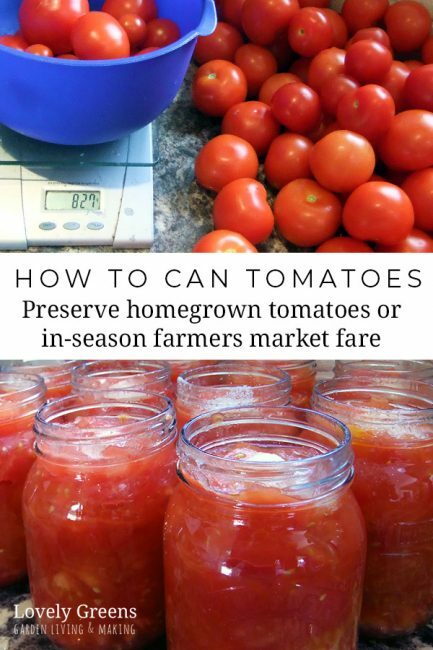 There aren’t as many people in the UK who bottle their own food so finding a modern method for preserving the tomatoes involved looking to some American sources – namely the Ball Blue Book Guide to Preserving. If you have it at home I used the recipe and instructions given for processing tomatoes in their own juice on page 22. My own notes are below. Inspect your jars looking for cracks or splits then wash them with soapy water and rinse well. Place all of your jars in the oven and turn the temperature up to about 180F / 82C and leave them in the heat until you’re ready to use them. This ensures that when you place the jars in the hot water bath that they won’t crack or shatter. While those are in the oven, place your lids and screw bands in a bowl and pour hot water over them, making sure not to exceed 180F/82C. 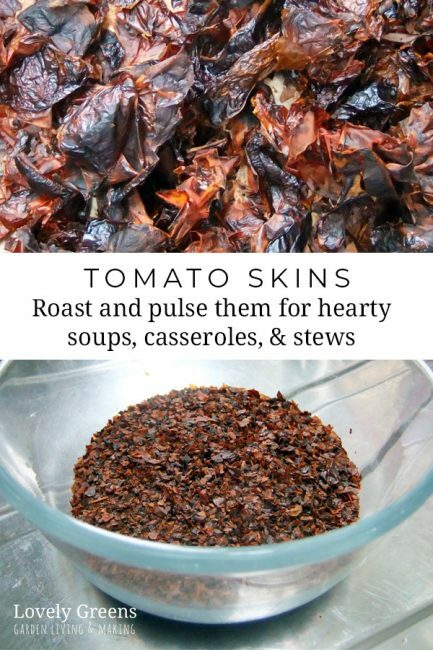 Skin your tomatoes by simmering them in hot water until their skins begin to split then immediately plunging them into a basin filled with cold water. When they’re cool to the touch you can easily slip their skins off with your fingers. You can compost the skins or do as I did and set them aside for drying into tomato powder. 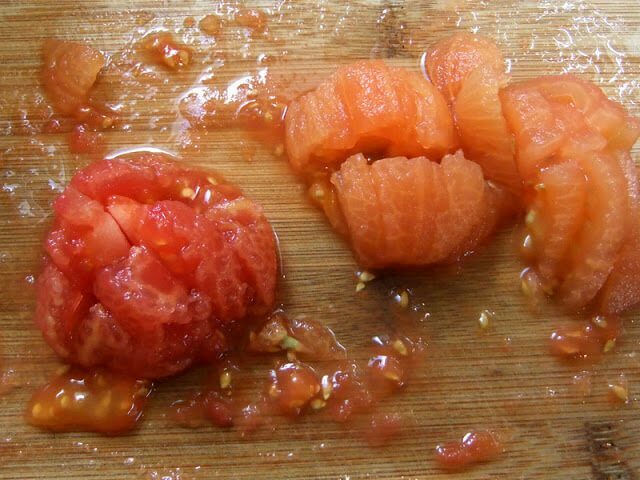 Remove the cores from the skinned tomatoes and then slice them up or leave them whole depending on your preference. When slicing, you can choose to halve, quarter, on chop them however you prefer. When they’re all prepared then you can begin taking individual jars out of the oven. Add 1 Tbsp of lemon juice to the bottoms of the pint jars and doubling that amount for quarts. 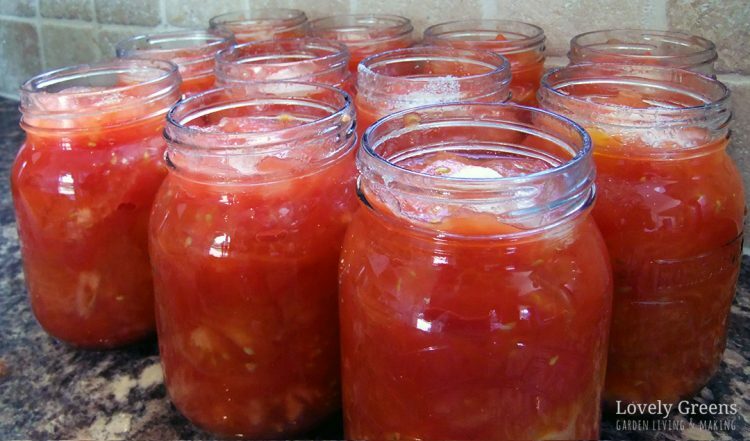 Pack the tomatoes and their juices into the jars leaving 1/2″ headroom. Add 1/2 tsp salt onto the top for each pint jar (1 tsp for Quarts) then place the lid on the jar and twist the screw-band on fairly tight. Process the jars in a hot water bath as is detailed in the below image. I felt that the 1 hour and 25 minutes processing time was a bit excessive so after looking into similar recipes I opted to go with 40 minutes at my sea-level altitude. Remove the jars from the pan and set them on a towel lined counter to cool. After that I labelled the jars and put them in the pantry. I found that if you dry the tomato skins out completely and then pulse them they make a delicious tomato powder. It’s similar in taste to sun-dried tomatoes and I’ve already used it in one pasta dish with plans on adding it to Goulash and other rich flavoured tomato-based recipes. I am interested in the fact that you say that the salt is optional. We don’t like a lot of salt in food and want to bottle tomatoes without, but I have also read that you need the salt to prevent botulism. Does the lemon juice do the same thing? The acidity of tomatoes is what helps them preserve well – the same stands for other canned fruits which also don’t need salt. I bottle whole tomatoes and add Italian seasoning and garlic for spaghetti sauce when u are ready for spaghetti just drain some of the juice out then dump in a blender and warm up on stove my family lives it and it is easier than the 8 hour process. I just did the same thing last weekend, primarily for the same exact reason. I want to know where my food comes from, as much as possible, and know it's the safest I can get it. I canned 28 jars of crushed tomatoes and am working on whole tomatoes and more tomato sauce this weekend. I, too, had to supplement my garden tomatoes with purchased ones, however, I was fortunate to be able to pick them at a local u-pick farm so they were fresh. Great article (as all your articles are). I truly enjoy reading your blog – it inspires me. I read the same article, very scary. I wanted to can my own tomato sauce, pizza sauce and salsa for the whole year but now I'm rethinking the tomato sauce. Wow, does it take a LONG time to cook down. 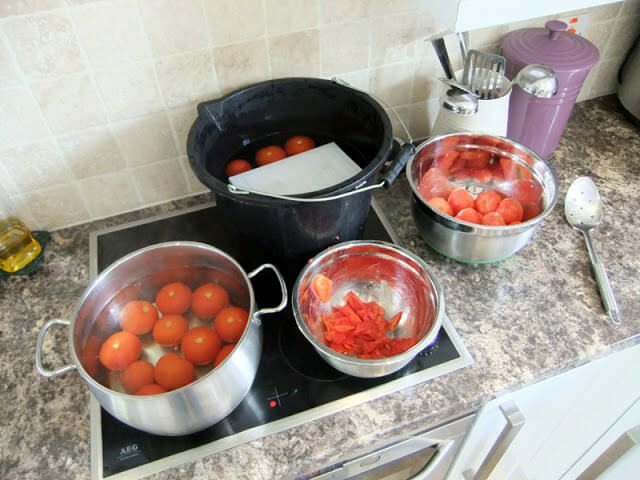 Yesterday I put 56 cups of tomato juice in my biggest pot, it took 8 hours to cook down. I got 4 quarts and 1 pint jar out of the whole batch. I agree with Sunnybrook Farm you should look into the Tattler Lids, they are BPA free. I started using them a few years ago after I found out that regular canning lids contain BPA. I've just purchased twelve of the Tattler lids off Ebay and I'm looking forward to experimenting with them. It seems that the only thing you need to replace is the rubber ring? Eight hours for tomato sauce sounds like a very long time! I buy tomato passata in bottles at the shop so I'm not likely to bother with making sauce either. Chopped tomatoes on the other hand are really quick and versatile for me – I use them in everything from chili, pasta and soup. Good for you for even doing it….we make tomato (pasta) sauce base each year the Italian way, and we buy our crates of tomatoes from local growers….we couldnt grow way enough to make the couple of hundred bottles that we need for the year…just for our family! A couple hundred bottles? Flip, maybe I need to make some more! 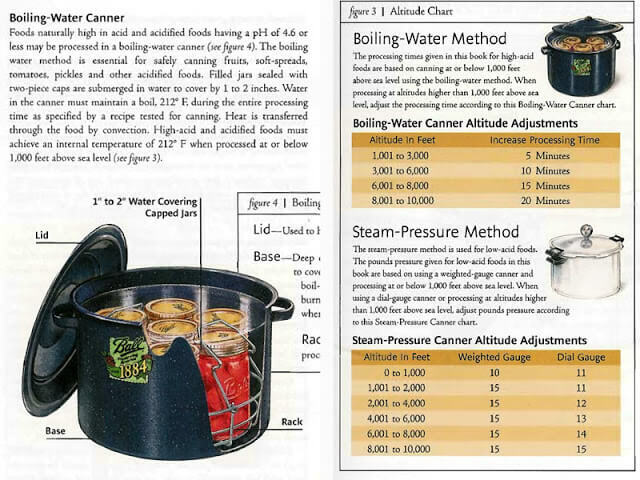 I would be happy to send you a copy of the canning book if you would like one! They generally sell them in all of the grocery stores in the US..the tomatoes look delicious! Sorry to hear about your tomatoes – lots of people have been having issues with them this year. Nothing like tomatoes in jars, I have them for lunch in the winter since I have so many, I have to use them every chance I get. If you can find Tattler lids, they can be used over for years so you won't have to keep looking for lids if they are hard to find. Good tip on the Tattler lids – I'm going to Google them right now. Just bought a pack of 12 off Ebay to try…it's a shame they're not available in the UK but fortunately it's possible to get them shipped here from the US.